The traditional method of supporting your bridge with poured concrete pilings is outdated. Helical piles are a better — and easier — solution. The helical piles will transfer the structure load to rock formations or stronger soil deep below the surface. Additionally, helical piles are easier to install in sloped areas without the need for excavation. 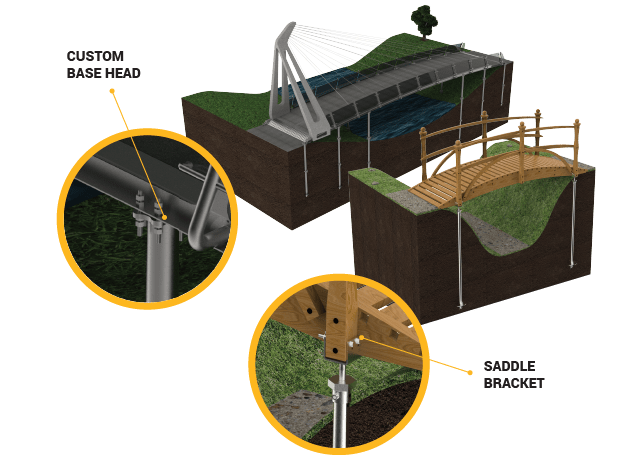 GoliathTech screw piles will solidly support the bridge over the long term, are much quicker to install, and the construction can begin immediately afterwards. Plus, they’re installed using small equipment that leave no damage to the land.